LD Series – Gaska Tape Inc.
Gaska Tape’s LD Series is a soft, low density, closed-cell PVC foam for general industrial applications. The LD Series is ideal where cost is a critical factor. Designed to solve your application problems, the LD Series will conform to irregular surfaces and curves. This material is generally used to seal, cushion, insulate and dampen vibration in a variety of industrial applications. A good choice for light duty cushioning or vibration dampening applications. Compresses easily with good recovery properties. Offers sound attenuation reducing sound levels. Seals out air, condensation, light and dust when compressed. Available in black and gray. Click Here to download our Limited Warranties. Click Here to download our Manufacturing Tolerances. Click Here to learn “Why we have Storage Guidelines”. NOTES: The length of the rolls vary depending on the thickness of the material. 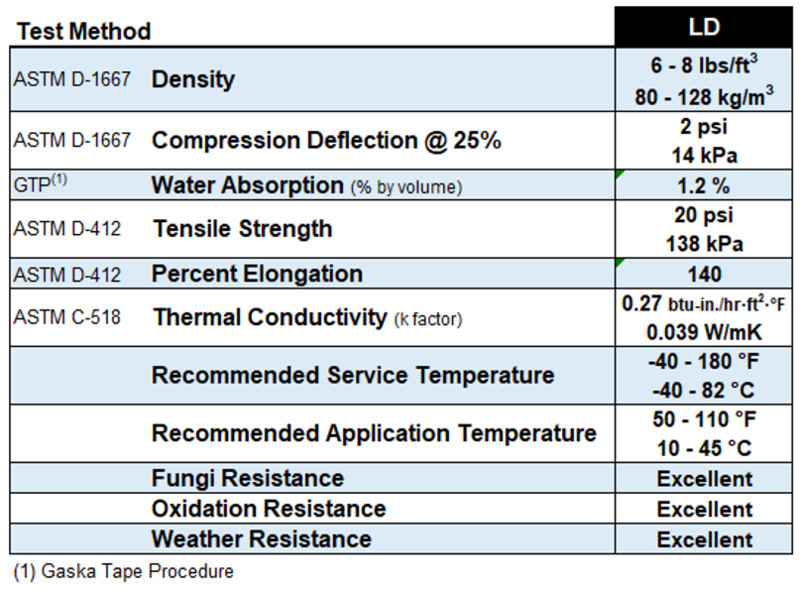 Gaska Tape offers standard length logs. Master logs are double the standard length plus 2’ and available upon request for quote. Typical performance properties and characteristics are based on samples tested and are not guaranteed for all samples of this product. Data is intended as a guide only and is presented without guarantees and without assumption of liabilities resultant from the use of information provided. This data is not to be used for specification purposes. Copyright © 2018 Gaska Tape Inc. All rights reserved.